The manner in which Rockford cruised past Grand Ledge on Friday, October 27th was both beautiful and devastating in it’s totality. 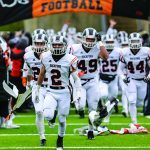 The game was one-sided from the opening kickoff to the final horn as Rockford won the Pre-District opener at Grand Ledge 36-0 to advance to the District Final at West Ottawa on Friday, November 3rd at 7:00 P.M. Rockford now stands at 7-3 on the season while Grand Ledge finished up at 8-2. The beating the Comets took began on the opening kickoff as a perfectly executed starburst return from the Rams found them beginning their opening drive at the Grand Ledge 34-yard line. Six plays later it was Austin Klein barreling in from the one and it was a 6-0 Ram lead with 9:53 left in the opening quarter. An errant snap caused the conversion to sail wide right and the score remained 6-0. But it didn’t stay that way for long. 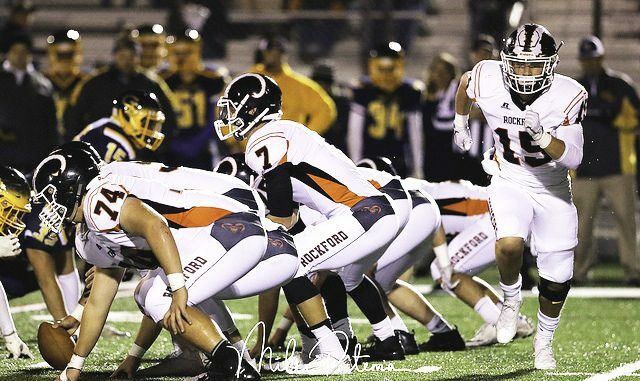 After forcing a quick three and out from the Grand Ledge offense, Rockford took possession of the ball at their own 44 to begin their next drive. This drive featured a 34-yard run from Ram quarterback Jason Whittaker to put the ball at the Comet 13. Three plays later Whittaker rolled right under heavy pressure facing a third and goal from the Comet six. Somehow he wound up and fired the ball all the way across the field to Jack Richardson at the five. Dodging tacklers and juking his way forward, Richardson squirmed into the end zone with 5:55 to play in the opening quarter. This time Eric Zeboor boomed the extra point through the uprights and it was a 13-0 Ram lead. 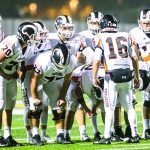 But the fun was just getting started as the stout Ram defense forced a fumble on the next Comet possession that was recovered at the Comet 43 by Eli Haddad for Rockford. Looking at a third down and goal at the Comet 13, Whittaker struck again for Rockford on the opening play of the second quarter. This time it was a perfect pitch and catch to a wide open Marcus Remtema in the right side of the end zone that made it a 20-0 game following Zeboor’s conversion with 11:56 left in the second stanza. But the first half heroics still weren’t finished for the Rams. 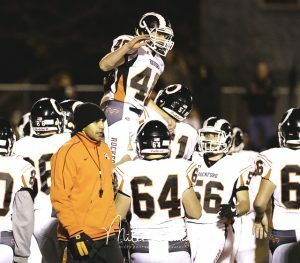 On their next possession, Rockford again marched down the field deep into Comet territory. This time though the drive would eventually stall at the Grand Ledge five. Zeboor promptly stepped onto the field and nailed a 22-yard field goal to make it a 23-0 Rockford lead and start a sizeable contingent of Grand Ledge fans heading towards the exit late in the first half. Following a Khale Showers interception in the third quarter, Rockford would add to their lead. This time it was Whittaker firing a bullet into the hands of Jake McLean around the Grand Ledge six-yard line. McLean broke a tackle at that point and fell into the end zone to make it a 29-0 Rockford lead. The Rams went for two on the conversion but were unsuccessful and the score remained the same. A Chase Novak interception set the stage for the final Rockford points of the night. The scoring play was a beautifully designed 20-yard pass from Whittaker to a wide open Logan Lee to make it 36-0 with 7:53 left in the final quarter following Zeboor’s PAT. Grand Ledge finally mounted a sustained drive at that juncture and reached the Ram 11. 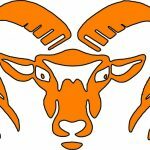 But the Ram defense that had worked so hard all night arose once again to deny the score and Rockford proceeded to run out the clock for the win. 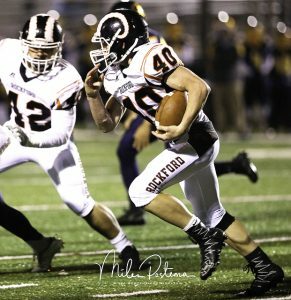 Rockford rushed for 264 yards on the night and it was all by committee. Richardson had 65 yards on 16 carries with Whittaker accounting for 54 on seven, Connor White contributing 47 on just six carries, Klein adding 49 on 13 attempts and Ian Rodriguez chipping in with 24 on a fake punt. Whittaker was 10 of 14 passing for 169 yards and four touchdowns. Three different Rams had three catches and all had a touchdown as well. Remtema had three receptions for 59 yards, McLean had a trio for 52 and Lee accounted for 32 yards on his catches.